Long data sets: the source sound file can be as large as the hard disk, so many hours of sound can be analyzed in one pass. The Event Detector is part of SIGNAL and can be called from user-written SIGNAL programs. The user can combine event detection with other SIGNAL commands to process the detected events and to automate the entire process. All of SIGNAL's analytical tools are available, providing a wide range of post-detection processing, including sound parameter measurement, editing, feature recognition, sound classification, time-of-occurrence logging, and storing detected sounds and measured sound parameters on disk. Any of these processes can be performed automatically on each detected event. Following are some application examples. 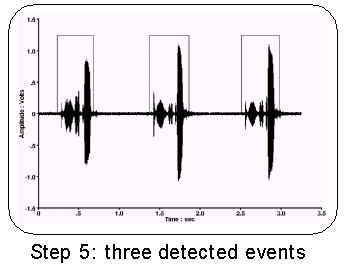 The most basic application of the Event Detector is to automatically extract all the target events in a sound file and store them for examination and further processing. This replaces the time-consuming task of manually reviewing large sound data sets and selecting, editing, and storing each event individually. The detector helps achieve uniform event editing by allowing the user to specify pre-event and post-event time margins which extend the detected signal by a fixed interval before and after onset and offset, respectively, so that stored events have consistent amounts of leading and trailing silence. Another basic Event Detector application is sound parameter measurement and storage. Rather than storing the detected sound events, the user's program could automatically measure various sound parameters for each detected event, then store the measurements in a text file for export and analysis. In the following example, SIGNAL calculates the power spectrum of each detected event, then measures and stores the peak frequency and amplitude in a text file. The Event Detector automatically returns the absolute time of occurrence (TOC) and duration of each detected event. Because TOC is based on the source sound file, it can have an accuracy of milliseconds over a time span of hours. This time base can be useful in relating sound events to behavioral observations from other media such as video-tape. This long time base also enables the researcher to explore long-term temporal relationships between events anywhere in the file - for example, the order, rate of ocurrence, and time-spacing of different sound types. 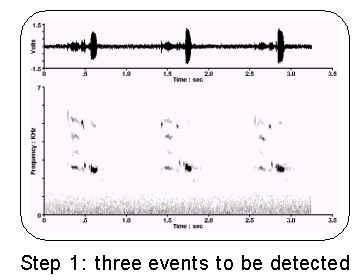 This process can be automated by combining the detector with automatic sound type recognition (see below): sound events are detected, classified, their TOC is logged, and sequence relationships are analyzed. In the following example, TOC and duration are stored in a text file for later analysis. Quantitative sound comparison can be applied to the detected events to perform sound type recognition and classification. Events can be compared to a set of pre-stored sound templates for recognition and classification, or to each other, to define and map sound type categories and describe repertoire. Recognition and classification tools include correlations of spectrograms, pitch contours, and spectra, as well as the statistical analysis and comparison of extracted sound parameters. Two-level detection is the application of a second round of selection criteria using SIGNAL to the sounds returned by the Event Detector, to help detect sounds which are more complicated structurally, or have poorer signal-to-noise, or are acoustically similar to non-target sounds in the environment. This strategy uses the Event Detector to parse the data stream into events and non-events, then uses SIGNAL to distinguish between target and non-target sounds. Second-level criteria might include location of spectral peaks, harmonic density, pitch slope, pulse repetition rate, etc. 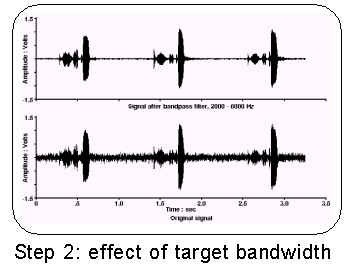 In the following example, sounds of the desired bandwidth and duration are detected in the first pass, then target sounds are selected based on pulse repetition rate. The user digitizes extended sound material, which might originate as field data or lab recording, into a continuous sound file. 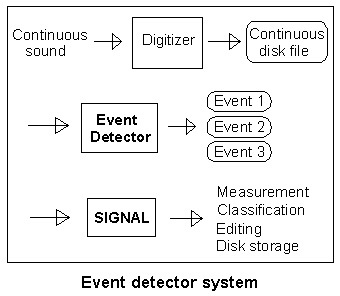 The user then calls the Event Detector to process the entire sound file (step 1), detecting successive events according to user-specified criteria and the detector's logic (steps 2-4). After each event, the detector returns the sampled sound and time-of-occurrence to SIGNAL for analysis, measurement, and storage. 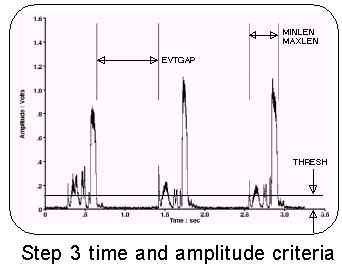 Sound events are detected on the basis of target frequency range (illustrated in step 2), minimum amplitude (step 3), and minimum and maximum event and inter-event duration (steps 3 and 4). These criteria allow the detector to separate sounds from background noise, distinguish target from non-target sounds, and link multiple sub-events (such as notes) into one event (step 4). Detected events are then returned individually to the user (step 5). Because the detector is part of SIGNAL, all of SIGNAL's analytical tools are available for post-detection processing. These can be used for sound parameter measurement, editing, feature recognition, classification, time-of-occurrence logging, and disk storage of sounds and measured parameters. Multiple analyses can be performed on the same source material. For example, one pass might detect all occurrences of a particular sound type and save them as sound files, while another might detect and record the time-of-occurrences of different sound types. The researcher can select a data set and detection paradigm, then run the analysis automatically. The detector includes a 35-page user guide describing operating principles, detection parameters, programming techniques, a sample session illustrating detector setup, and two operating demos.